The third season of House of Cards was just released on Netflix this past Friday, and a little over 24 hours after I begun the new season, I’m finished (I don’t really have too much to do these days). I binged through the entire second season on Valentines Day weekend last year, and due to the rather dreary and cold weather here in Austin, I sat inside all day Saturday to wrap up the season. Again, I won’t reveal too much about what happens this season, as that is for a post that you should look out for sometime this week or next weekend. But I’ll try my best to describe what happens this season, because trust me when I say that you’re in for a doozy in Season Three of House of Cards. The season begins months after Frank Underwood has been sworn in as President, and he’s not exactly the most popular of President’s. He has a very controversial program called AmericaWorks, which is seen as a replacement for programs like Social Security, Medicare and Medicaid, as well as other questionable calls under the Underwood administration. Underwood also has to battle with the Russian government, mounting tension in the Middle East, and his eventual reelection campaign in 2016. But one thing that the past seasons have touched on slightly but not to this degree is the relationship between Frank and his wife Claire, which is the most interesting dynamic of this new season. Kevin Spacey does a brilliant job hamming it up as Underwood, and Robin Wright brings yet another magnificent Lady Macbeth-esque performance as Claire. It’s very hard for me to get into everything, because there’s so much that I’d like to discuss and write about, but if you’re a fan of House of Cards with its political theater and sometimes unrealistic but captivating set pieces, then you’ll be in for a treat with this season. I mentioned to somebody earlier that this season feels like The West Wing was instead made my David Fincher and not Aaron Sorkin. Even though Fincher is only an Executive Producer on the show and directed the first two episodes of the first season, his style and dark tone has been seen in every single episode of Cards since it began. And a lot of people have complained about this format that Netflix releases the show in, with the entire season being able to viewed on the same day as release. There are several television critics that prefer to watch the show with one episode a week, similar to how television has worked since the beginning of time. 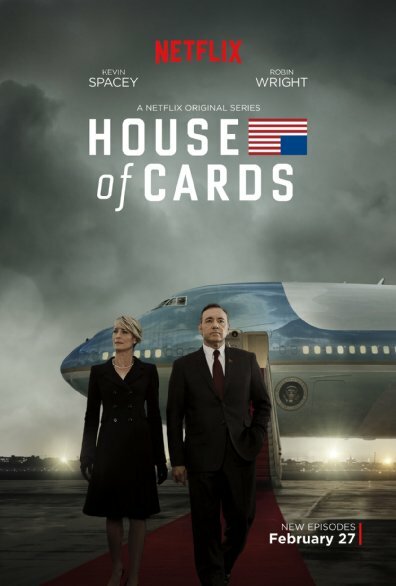 I love this format because House of Cards, no matter how implausible or crazy the show can get at times, it’s a very addicting and massively entertaining television show, so the reason I breezed through this new season was because the writing and acting is so good that you get hooked immediately. Yes, I can understand how some could criticize the season for being more of the same, and since Underwood is now President, where does he go now? I’d say that House of Cards has one more good season left in it after this season, and hopefully Beau Willimon will realize this and do one final season. I don’t want to see this show dragged out for years, becuase I’ve seen great T.V. shows fall because of that. This is not a perfect season, but for the fans of the show, it’s exactly what we needed. As mentioned before, the entire season is available to stream right now. I’ll put up a more spoiler filled review in a few days.